A three-year soil trial is underway at Harrison and Winkler ranches in Santa Paula. The overall objective is to determine the economic value of using compost in citrus orchards--taking into account yield improvements and fertilizer use reduction versus the cost of the amendments and their application. Soils across thousands of farmland acres in the Santa Paula area are characteristically low in soil organic matter and are calcareous (containing calcium carbonate) in nature. Soils low in organic matter are poor at holding water, limiting the "oasis" needed around root zones to support the plant and beneficial microbes. Calcareous soils are high in pH and limit nutrient uptake in plants needing an acidic environment. Improving these soil properties has the potential to increase soil health, thereby enabling better fruit production and reduced water usage. The trials feature adding spring-season Agromin compost at 10 and 30 tons per acre application rates and manure at 10 tons per acre. 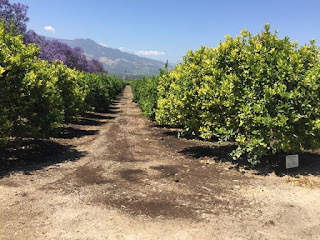 Each test plot is three acres with established lemons and avocados and new Tango plantings. Soil and leaf nutrient levels are being tracked during the trial. The trial is also testing if the use of these amendments reduces leaching of herbicides. These trials will be completed in 2020.